Bored of doing the same old things? Want to try something new and fun in Hyderabad? Here is a list of unique experiences in Hyderabad. Make sure you cross them off your list soon! Sangareddy Jail — a 222-year-old prison in Telangana has an interesting experience — Feel The Jail — where any of us can spend a night inside a cell by paying INR 500. When you finally choose to experience Feel The Jail, you'll be handed a prisoner's uniform, and for the next 24 hours, you're entirely cut off from the outside world. It isn't as bad as it sounds because we've heard that people understand the true value of freedom when they are inside. Dare to try this? Dialogue In The Dark, located in Inorbit Mall, is a dining experience where you get a taste of the darkness. Play cricket in the dark, listen to the splash of a fountain, have a cold drink and hold a conversation with your friend. You are led by a visually disabled guide, who maneuvers through the alleys of this place and helps you have a great time. If you haven't tried this experience before, you cannot miss it. Purani Haveli was the Nizam’s residence, during their reign, and it is close to the Chowmahalla Palace. It has now turned into a museum. Since it's a hidden gem, most people skip it on their visit to Hyderabad, making it less populated than Salar Jung Museum or Chowmahalla Palace. It has an astonishing collection of the many gifts given to the Nizam, and the ensembles of the royal family. Go here for an evening to indulge in some history, and on your way back enjoy the chicken kebabs and biryani in the streets nearby. Bahubali took the world by storm with its magnificent sets, special effects, and cast. Did you know that you could visit the fantastic kingdom of Mahishmati at the iconic Ramoji Film City? From the artwork of leading characters like Devasena, Kattapa, Baahubali, and Bhallaladeva on walls to intricate pillars, magical staircases, the life-size horses along chariots, structures of elephants, the Shivalinga, and the underground prison are all open for the public to explore. Taking the game of themed restaurants a notch up and above, Robo Kitchen in Jubilee Hills is an exciting surprise. 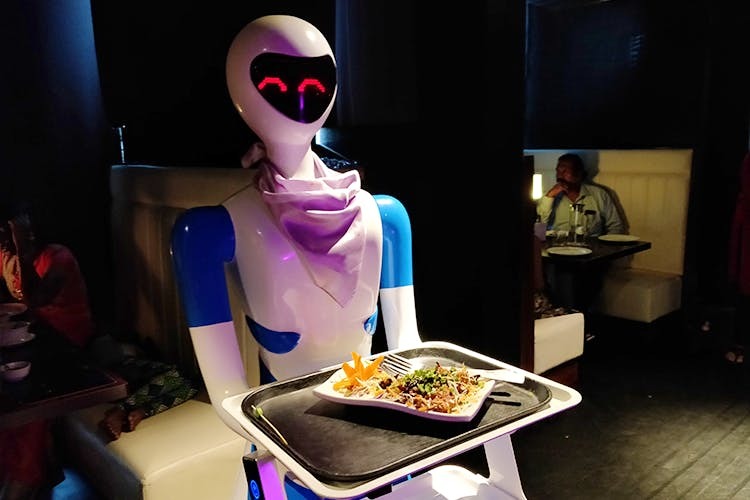 This is Hyderabad's first robot-themed restaurant where you're served by robots. Eerily dark with faint music blaring from the speakers, your first rendezvous with a robot is supremely fun. We were quickly shown to our table and an Android tablet was handed to us. We placed our orders from the tab, and in no time, the robots were whishing past other tables to serve us. You love jumping on a trampoline, don’t you? Imagine a whole park consisting of only trampolines. Yes, that’s right! Sky Zone is a trampoline park that lets you jump around. You can also enjoy some games while jumping like dodgeball, basketball, and many others.